You can easily put up a five-storey building inside it. At its widest areas, it is about 75 metres in length, 72 metres in width and 16 metres in height,” is how underwater explorer Dharshana Jayawardena recollects his encounter with a massive underground cave chamber. It is inside the belly of a mountain range, on the way underground to a mysterious lake called Ravana’s Nil Diya Pokuna off Ella, a place entwined with the Rama-Sita legend. The expert diver, the first to have discovered and explored in this country, an underwater cave system lying beneath this beautiful lake, tells the Sunday Times that it was simply “an amazing sight to behold”. The Nil Diya Pokuna, lying 80 metres deep inside a mountain cave in Karandagolla can be accessed via two independent entrances, of which the better-known one is situated in a forest reservation in the area, while a villager, R.M. Meththananda, then discovered about three years ago a second entrance on a private property. 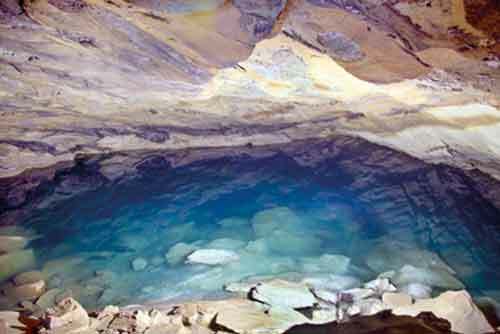 Although many had reached Nil Diya Pokuna via both ways, Dharshana was the first to dive into this lake recently and discover a hitherto unknown underwater cave system. An experienced technical Scuba diver known for his shipwreck discoveries and lucidly documented work, Ghosts of the Deep- Diving the shipwrecks of Sri Lanka, Dharshana had until then heard of Nil Diya Pokuna through word of mouth and was intrigued by the possibility that the caves could extend underwater. 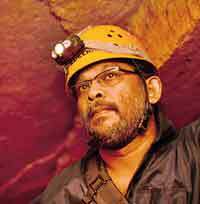 “After completing three cave diving courses and earning the Full Cave Diver certification in Thailand, exploring about 12 challenging caves, I was looking for underwater caves here at home when I heard of the Nil Diya Pokuna,” recollects Dharshana and immediately set about exploring it with the help of Meththananda. Legend has it that Sita, the beautiful consort of Rama, the Prince of Ayodhya, was abducted by Ravana, the king of Lanka, in an act of revenge. was held captive in the island of Lanka and, according to local folklore, Sita was brought to Nil Diya Pokuna to bathe. Some of the villagers even believe that Ravana’s body still lies close by, buried here after he was slain by Rama’s spear in the battle to reclaim his beloved Sita. “Many warned me that a divine power will stop me from exploring the cave as the place is shrouded in myth,” says Dharshana with a smile. The chilly, 23C degree, deep waters of this liver-shaped pool were so intense that it “numbed my mind” he recalls. “Unlike the normal ocean temperature which is about 28C to 29C, the waters of Nil Diya Pokuna were biting cold as the pond lies 776m above sea level in a mountain range and the dive required a thicker exposure protection suit than what I usually use in the ocean.” With just torchlight as the only source of illumination in the otherwise ‘pitch black surroundings’, Dharshana initially explored the left side of the lake and found an underwater entrance that sloped down into a wide passage. After the initial dive to the caves came three more dive expeditions. Dharshana named the left underwater entrance as Ravana Maga and the right entrance as Sita Maga. In the second dive expedition, he managed to explore Sita Maga comprehensively, installing another permanent guideline. In his third dive expedition, Dharshana swam down Ravana Maga and beyond the tricky Jatayu pass only to come across Sita Maga after a while! It was an ‘Eureka moment’ for Dharshana to be able to connect these two underwater pathways beneath the Nil Diya Pokuna. “It was amazing to discover one single big underwater cave system which could be accessed by two different sides,” he says. 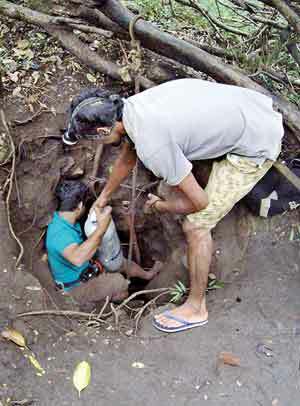 In his fourth dive, he explored much further beyond Jatayu pass, installing permanent guidelines and discovered that the cave continues with no visible end in sight, indicating perhaps that this cave could continue underwater for even many hundreds of metres more. The caves are completely devoid of marine life. “It is breathtaking to see undisturbed areas of the underwater cave. It is a place of great beauty and tranquility. However the water seemed sterile except for a small worm found at the surface,” he said. With the footage acquired in these expeditions, Dharshana and his team are now producing an exciting exploration documentary called Deep into Earth which will be released next year. Another notable result of the Deep into Earth project was that, one key expedition member, Manjula Wijeyaratne was able to acquire precise barometric and laser measurements of the dry part of the cave and create invaluable detailed maps of the terrain. Deep into Earth also received valuable input from Dr. Wasantha Sena Weliange who also accompanied the team on the fourth expedition to the cave. 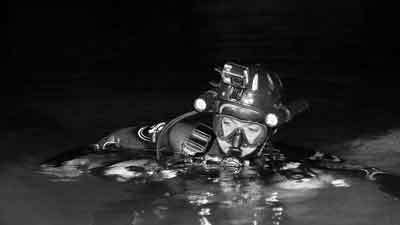 Cave diving is one of the most dangerous forms of Scuba diving and requires a diver to be in a situation where he/she cannot immediately ascend to safety in case of an emergency. “The only way back to the surface is the way you came back, the reason why I had to use a guideline. It is the only reliable way to come back without being disoriented and losing your way. By laying permanent guidelines, future exploration will be easier as subsequent cave divers can now simply follow the line,” he notes. This, as he further explains requires a special equipment configuration that has backups including a minimum of two scuba tanks and multiple torches. 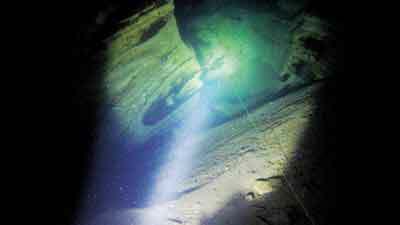 Cave diving may also require decompression diving as a diver goes deep and can’t come straight back up but needs to stop at different levels to decompress. The formation of Nil Diya Pokuna as Dr. Weliange explains is interesting. The earthly materials which surround the cave are porous. When it rains a portion of the rain flows along the surface downwards and a portion is soaked to the soil. Soaked water seeps through the soils due to gravity and this drops to the void from its roof. This accumulation of water has created the pool. Efflorescence of South Asian Sci-Fi?